Health care legislation provides patient autonomy and involvement in decisions,and mandates physicians ask patients about preferences for end of life care. 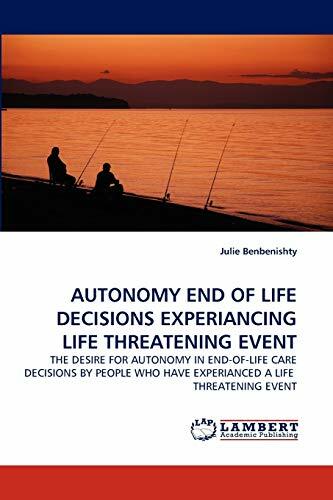 Discussions about such care often postponed until the patient is too sick to participate.Advance directives are potentially useful tools to express a patient's wishes in the event of future incapacitation. Instructional advance directives may fall short of preserving patient self- determination because they fail to communicate information in a way that improves surrogates' ability to honor patients' specific treatment decisions.There is a need for population based data on patients' preferences for treatment in order to inform health policy. Given that clinical decisions are made at the individual level, there is a need for further development of decision making tools for use in clinical practice.The aim of this study to identify patients who like to participate in their medical decisions,to distinguish their unique socio-demographic characteristics. This understanding will give health care professionals the tools to facilitate and individualize discussions about end-of-life issues. American born living Israel since 1974. Nursing school then Army.Working,researching in intensive care for 34 years. Post graduate courses include, intensive care, trauma, communications, management, good clinical practice.Serving as Coordinator of International Terror Medicine- Mass Casualty workshop. On Faculty Hebrew University.